Fiona is the author of Pagan Portals: Pathworking Through poetry, described as ‘ exploring, knowing, understanding and dancing with the wisdom the bards hid in plain view’. I caught up with Fiona to find out a bit more about her love of poetry and how the book came about. Mabh: Tell us a bit about your book, Pathworking through . What inspired you to write it? What do you hope the book will bring to the reader? 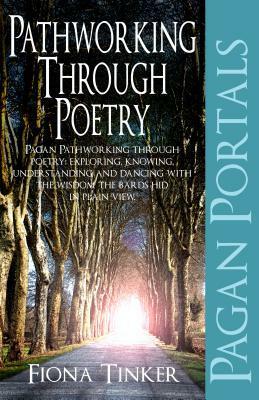 Fiona: Pagan Portals: Pathworking Through explores the concept of using poetry to explore a personal spirituality/a Pagan path, with examples drawn from poets and writers who ‘talk’ to me on a deep, personal level. There is a connection in the writing I discuss that speaks of shared experiences and insights, no matter how much time and history separates us. The idea to write it came from discussions with friends and the happy discovery that a lot of us had been using a ‘core’ of Irish-Scottish stories and poems as part of our Pagan paths, even though in our formative years as Pagans – in the 1970s – we had no connection at all with each other or our respective Pagan teachers / mentors. Becoming a Pagan was quite a different experience back then in the pre-Internet days. were hard to come by and expensive, for instance. However, in talking with other Pagan friends in later years, I found the similarities in some of the stories and poems we’d used really interesting and it made me look again at a lot of things I’d become a bit blasé about over the years. My book doesn’t lay out a Pagan path, that’s not its purpose. Finding your own path is a very personal journey once the initial ground work has been laid and you are ready to take that step. However, the book does suggest some ways readers may use to find their own path through the hidden wisdom in poetry. is a powerful medium in which to transmit occult teaching. I wanted to share some of my experience with readers in the hope that they might explore the poetry that speaks to them as a method of Pathworking in their own practice. It’s an amazing experience and one it felt the right time to share. MS: Can the principles in the book be used by Pagans and non-Pagans alike? FT: My initial answer to this was, ‘I don’t see why not,’ but second-thoughts suggest this might not be so. If a non-Pagan is more used to having their personal spirituality directed by external influences, then I don’t think this would work for them. Paganism is a personal, experiential religion, albeit one where we have some shared ethics and concepts about our relationship to the land and the Gods. In general, when we move past our initial years of learning we are ready to explore what we have learned in relation to the lands we live in and perhaps to explore the lives of some of the ancestors who live on in our genes. One of the things we do learn early as Pagans is how to protect ourselves, whether through the use of a circle or the creation of a sacred space. If we set out to work solitary, as in these kinds of Pathworkings, all of this becomes our sole responsibility, there is no third party directing manoeuvres. Those who are more used to – or more comfortable with – having others direct them may not get very much from this idea at all. And that is fine – Pathworking won’t appeal to everyone any more than going to church to have someone else interpret scripture does. MS: What was your biggest challenge in the production of this book? Although it is a short book, finding the time in between working full-time, the usual domestic stuff and my voluntary work on behalf of the Scottish Pagan Federation meant I had to be really disciplined and make myself write at least 800 words a day. That wasn’t always easy after a particularly hard day. MS: Tell us a bit about the Pagan Portals series this book is a part of, and how you became involved. FT: Pagan Portals is a series published by John Hunt Publishing, through their Moon imprint, which aims to share snapshots of contemporary Pagan practices. There are about a dozen in the series, with more planned. The subjects covered are varied and the Moon Book catalogue will just about have something for everyone to dip in to. The series is intended as an introduction to ideas and I would love to have the time to set up a Pagan Reading Group using them. The hours of joyful discussion and squabbling we could have over the ideas in the books is delicious to contemplate. Actually, I might suggest this to the local moot! MS: What do you feel has been the biggest reward after the completion of this project? FT: The biggest reward was writing this book for my son, Iain, so that he can understand something about my Paganism and about his mother as a person; not just as his mum. MS: You teach English; do you utilise your interpretations of the poems in your book (Yeats etc) with your students, to enable them to gain a deeper understanding? FT: Not to the depth in this book, no, that’s not appropriate. But I do not shy away from exploring Yeats’ occultism as one way of exploring and interpreting his poetry. This is part of who he was and what made him tick. If that side of him is ignored, the understanding of his poetry can only be partial. Yeats is part of the Scottish Advanced Higher course, which is taken by 6th years here and is at a level equivalent to the first year of university. Naturally, I’ve been selecting this option as part of the course I teach and it’s been wonderful to share his poetry in some depth with a succession of students over the years. MS: And likewise, did your teaching experience lend itself to the creation of this volume? FT: I don’t think so, not really sure. Hmm. That’s actually quite a hard question. I would say my MA Literature, History and Cultural Studies gave me the tools to pull together earlier learning and academic learning, thus enabling me to present my ideas in my book. Part of the work here was on the Irish Literary Revival and this re-awakened my undergraduate love of Yeats, to the extent that his works became my ‘light’ reading in those years. My MA study was research into Holocaust survivor testimony and in particular how those experiences were conveyed in print. Primo Levi was one eyewitness to a lot of nightmares that most of us can not begin to imagine, let alone understand. Yet his writing bears witness to not only the atrocities and the natures of those who carried them out, but also the human spirit and the light in those who did what they could to help people in the camps. As Levi grew older, he seems to have felt more and more disassociated from the world, as if his experience had marked him out in some way. He referred to himself as an ancient mariner figure, adrift in a world from which he increasingly felt apart. I used Coleridge’s The Rime of the Ancient Mariner as an extended metaphor to explore and understand Primo Levi through his writing, using historical documents for context. He was an amazing man and his writing is profoundly beautiful, moving and it dissects what it means to be human. However, on the other hand, 20-odd years of teaching have given me the experience to get things across in an accessible way and I hope I’ve managed that in my book. So I guess the answer to this question is both yes and no. MS: You speak of the potential loneliness of the Pagan Path; did you walk your own path alone for a time before discovering like-minded people? FT: There were a few people around me when I was younger, who taught me through story, song and example, and I will be forever grateful to them for this. Being pagan was not something you shouted about in the 70s and this quietness is something I still carry with me, no matter how open I am about being Pagan now. It was a bit lonely at times but the specifics of my path and those I work with are private and not something that I would talk about in a casual conversation. In that sense, I still walk my path alone. Although I’ve realised over the years there are a lot of us walking with the same influences, if not exactly the same path. MS: Why do you think so many writers in the 19th Century were drawn to membership of The Golden Dawn? FT: Society changed enormously from the late 17th C. A lot of people were aware that the march to ‘progress’ cost humanity its soul, bit by little bit. A lot of people felt the need for change, the need for reform and the need to escape both the soul-destroying, dehumanising effects of the Industrial Revolution and the demotion of humanity to piece work in the Victorian version of the economic miracle. Money became the driving force and people became devalued. Consider how little importance or value is put on humanity now as a creative force for good, a force who can bring beauty to the world, to enhance it. Arguably, that rot started with the ‘dark, satanic mills’ – or more specifically, with their owners who focused on money at the expense of so much more. Certain Victorian religious groups could also see this happening. The Quakers certainly could and much that is good from that time period – prison reform, planned garden towns, decent working and living conditions and an appreciation of workers as people, for example – come from the Quakers admirably walking their talk. movements was perhaps a way of countering this and connecting again with the creative and spiritual forces that make us complete as human beings. The Golden Dawn attracted thinking, creative people and that is one reason why I think so many writers were drawn to it. It’s interesting that they felt drawn to the ceremonial magic and ritual involved though. Maybe the order it gave through its practices was a counterbalance to chaos elsewhere in their lives / societies? MS: The three poets you chose for your book are W. B. Yeats, Fiona MacLeod and Seumas O’Sullivan. What drew you to these guys in particular? Have you always been fond of their poems? FT: I was introduced to Yeats and MacLeod when I was a child by Freddie Anderson, a writer from County Monaghan, who was my neighbour when I was growing up. Freddie was a fabulous story teller, one of the three I was very, very privileged to have in my childhood. Although he could ramble on a bit when he had a wee drink in him, his stories were wonderful. The memories of the fun we had at Hogmanays over the years are precious. Anyway, Freddie lent me some Yeats poetry books because he thought I’d like them. He was right. I have been fond of Yeats’ poetry and other writing since then; although a lot of it I had to grow into, being a bit young to fully understand. MacLeod was an eye-opener. I’d learned a lot of mythology and folklore transmitted orally from a woman named Lizzie MacPhee. She was illiterate, in that she’d never been taught to read and write, but my word, Lizzie carried her library in her head. I found a lot of ‘her’ stories in the folklore collected by MacLeod when I was a bit older. O’Sullivan was a find and a half in a second-hand bookshop a few years ago. I was idly browsing, took a slim volume of poetry from the shelf and it fell open on one of his Angus poem. Pow! I own a lot of his books now too. MS: You speak of protecting one’s self while pathworking; have you ever had an experience with an undesirable element while pathworking? FT: Yes, I think that is a basic mistake we all make. It’s certainly a learning experience. MS: What’s the difference between pathworking and guided meditation? FT: Pathworking is a personal interaction between you and your Gods. Guided meditation is different: someone else leads and you follow. MS: I found it fascinating reading the Scottish variants of the tales of the year, for example Brigit and Angus as opposed to the Irish ones (Brigid and Óengus, and not linked in the same way), which are part of my heritage. Did you have to do a great deal of research, or are these aspects all parts of your Pagan path anyway? Have you learned by word of mouth and tales passed down, or has there been a great deal of hitting the books too? FT: There is an element of a shared heritage in that a lot of the West of Scotland has Irish heritage as well as Scottish heritage. My paternal roots are in Donegal and there are relatives living in Ireland, so I got stories from both sides. I’ve pondered a lot on the differences / additional attributes in the shared Gods. The relationship between Angus, Bride and the Cailleach was a folktale, collected and written down by Donald MacKenzie, but told as a story long before I read it, about the battle between summer and winter. Whether the stories from Ireland have been added to later is unclear, but I do feel we are talking about the same Gods, just different aspects that may be peculiar to Scotland. However, the Scottish folklorist, Stuart McHardy, has written extensively on Brigit / Bridget / Bride, looking at whether they are one or two separate Goddesses and he has some fascinating ideas that are great to explore and think about. I didn’t do much formal research for my book, these are stories / myths I’d heard from a young age, then discovered in the collections of various folklorists as I grew up. That’s probably when I hit the books – you find one, it leads you to another and you praise the ghost of whoever came up with the idea of a bibliography. I did do some background research into O’Sullivan as I knew nothing about him until I found his book. The interpretations of the poems are personal, rooted in both my subject and my practice. I suppose any research here is my reading over the past 40 years or so – I was an avid reader as a child and a teen and that hasn’t changed now I’m in my sixth decade. MS: Have you always enjoyed writing? Do you ever write poetry yourself? What inspires you? FT: Yes, I have always enjoyed writing in one form or another. I’ve written some poetry but I’m not sure it’s for public consumption! Sometimes it can be the most mundane thing that inspires. I remember being 17 and sitting on the steps of a hall in Partick, Glasgow, waiting for some friends to turn up so we could get on with a band practice. It was about 5pm and the rush hour was well underway: noise, petrol fumes, too many buildings. Horrible. But opposite where I sat there was a small public garden with the most beautiful rowan tree in it. The sun suddenly shone on that tree and I was transported by the sheer beauty of it, its colours and the vibrant life shining from it. It was an amazing experience, probably the first time I experienced that ability to ‘leave’ and to see what was really there and truly important. That inspired me in so many ways, even today when I think about it; I am back in that time and place and stunned by the awe I felt. MS: Are you planning any more books at the moment? FT: There are two underway at the moment, but I’d rather not say too much about them just yet. I have a very small vignette in a new book from Moon . The book is called Paganism 101: An Introduction to Paganism by 101 Pagans, edited by Trevor Greenfield. MS: And any other projects on the horizon? FT: I’m very much enjoying writing short pieces for children in Lora Gaddis’s magazine Pooka Pages. This is a free magazine for Pagan children and it’s available to download www.pookapages.com It’s actually really hard to write for small children and I’ve certainly enjoyed doing this. Another thing I’ve been busy with is reviewing books – it’s great to be asked to do this and the books I have reviewed have been first class reads. At some point, I will have to pay attention to the mundane life projects, like getting the boiler fixed before winter gets here properly, but that kind of stuff is for another day – probably the one where there is neither heat nor hot water! You can find Fiona’s book on Amazon and through other good book retailers. Visit Fiona at http://fionatinker.wordpress.com and http://www.scottishcelebrants.co.uk .